All the pools are reporting similar stats except they haven't found blocks in a while. The one I linked had more results. That's why I linked it. Ok so is it normal to expect an i7-4930k (high end $500 CPU) to mine only .1447 MRO in over a day? No, your pool is unlucky. On average you'd expect something like 2 MRO per day. Yes, the CPU power did double over a single day. No, your pool is unlucky. On average you'd expect something like 2 MRO per day. I wil Follow this coin, good concept and I invested some BTC into It. wise decision, do so before it hit big exchange. ---it also applies to Qora. http://moneropool.org has disabled longpolling. You should now be able to mine there with cpuminer-multi and we should find blocks more often. Will definitely be keeping an eye on this coin. I'd like to address the comments that have been bouncing around, particularly the points AlexGr raised. I read some of the back-and-forth, and I'm glad we are debating and engaging like this. As a brief history lesson, do you remember Tenebrix? It was the first scrypt-based coin. To quote Buffer Overflow's thoughts on the matter: "The block reward at block 1 was 7769999.00000000 TBX, then continues with 25.00000000 TBX for each block after that." Tenebrix was unabashedly premined, just as BCN has been. Litecoin cloned Tenebrix (Artforz was even the main developer contributing code to both Tenebrix and Litecoin), added a few small changes and bug fixes, and there you have it. Nobody really remembers Tenebrix or even Fairbrix (fair relaunch of Tenebrix by Coblee, who launched Litecoin at roughly the same time - it died due to lack of any hashrate which made a 51% attack trivial), but Litecoin? Well. Need I say more. I do not think any of us have any bug-bear with the BCN developers. But it is a fallacy to believe that they are wizards that wrote the code and therefore the only people capable of maintaining it, as was already demonstrated in the Tenebrix / Litecoin debacle. Litecoin certainly didn't need to wait for lolcust to make code changes for them to fix bugs and improve the codebase. - The blockchain was not publicly observable or observed for those 2 years. We have no reason to believe it is true, and even if it was true it still means that ~151 billion of the 184 billion BCN (82%) were mined prior to its public release. Think about that pragmatically. Would you want to use a currency where unknown actors controlled over 80% of it? This alone takes Bytecoin from being decentralised to being centralised by virtue of those controlling the flow of the currency. - Thus far we have not had any outpouring of public, known figures stating that they have used BCN for the past few years and can back up the 2 year claim. This means that the 151 billion is in the hands of people unknown, unknowable, and untrustworthy. Not only can they perform massive market manipulation with that, but everyone is left dabbling in the shallow end of the pool. Practically: at the current block reward the BCN network will spit out ~82.5 million coins a day down to ~44.7 million at the end of the year. That means that between now and the end of the year (224 days) the network will produce around 13.83 billion coins in a supposedly fair manner, or about 7.6%, barely enough to swing a cat much less affect the power wielded by those controlling 82% of the supply. By comparison, Monero has had 846 707 coins mined to date, of a total of ~18.4 million coins, or 4.6%, which leaves the market wide open for all to participate. 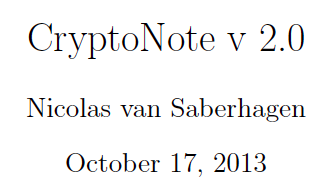 - The CryptoNote whitepaper was published on October 17, 2013, and the first commit to the Github repo was on November 15, 2013. By means of a comparison: Satoshi Nakamoto released the Bitcoin whitepaper in November 2008, and the network started in January 2009 with the first client, a not-too-disimilar timeframe. Had the BCN network started in November nobody would be questioning it. Rather, it stands to reason, by all accounts, that the individual(s) behind the CryptoNote whitepaper either wrote the initial code and gave it to the Bytecoin developer(s) who then ran with this, falsified a blockchain (trivial), and released it publicly in March after blockchain falsification was complete. - The BCN mining code shipped purposely crippled, presumably as a way of making the falsified blockchain seem legitimate. Not just weird or written by a cryptographer who doesn't know how to optimise, but purposely crippled for slow mining. Things like recalculating a static value in every iteration of a loop instead of just once at the beginning is not a mistake, especially when viewed in light of the claimed 2 year history. Did nobody care to optimise the hashing code in 2 years, not even to improve the amount of time it takes to download and verify a blockchain from scratch? I find that unlikely. On the other hand: if you glance at our Github commits you'll notice that in two iterations (26c1a8569c and 49d55d3c30, primarily) we first improved the hashing by 2x its initial performance, and then further improved it to 12x its initial performance. It appears that the BCN devs are so lazy they haven't even merged our changes in, so everyone mining on their network has either used our changes or is mining 12x slower than they could. Or they just have a significantly faster miner already and couldn't be bothered. - On their website, wherein they claim 2 years of stable work, they say: "Launched back in July 2012, Bytecoin has proved that it is going to stay for years to come." If that was the case, how did they not notice critical issues in the RPC API? The documentation on their wiki is blatantly incorrect (adding a trailing slash to the JSON RPC API URL causes a 404), and running simplewallet in RPC API mode tends to silently lose its connection to the daemon every few hours. That's a surprising issue not to have picked up in 2 years - was nobody using the RPC API in the wallet? None of the BCN merchants accepting payments needed to track said payments automatically? This seems highly improbable. 2011 wasn't exactly 2014. Post-2013 boom, the crypto landscape was filled with clones and thus the level of acceptability has gone down. It's a stretch to go the "centralized" route by virtue of money supply distribution. But no, with 80% premine I'm not interested in being dumped by the bagholders, even if they are selling at 1 satoshi. As I see it, having MRO take everything and upsetting the BCN devs by capitalizing on their work can backfire big time as they might "nuke" the clones and go with a V2 which heavily improves on V1. And then it's game over. This is a really good point that I had overlooked myself. The only way to position MRO for the long term is if the core developers are Cryptographers that have the expertise to stay ahead of the Bytecoin developers. Otherwise a BCN 2.0 fair launch could be a problem. If I was a BCN 1.0 dev, I would dump my BCN making myself a millionaire, and restart with the official BCN 2.0 to continue with my passion of making an anonymous Crypto without having to be greedy anymore. How capable are the Monero developers? What can they introduce in "V2" that can't be merged downstream? Every significant improvement Bitcoin has made has been merged down into Litecoin, Dogecoin, and every other fork. "Restarting" won't be an option, as by then they'll have too many people holding coins that won't let BCN go (even if their holdings are a paltry sum compared to the premine). They can do a relaunch, but someone else will continue running with the original BCN for fear of losing their "investment". In terms of our capabilities, one need only look at an obvious example: in the ~4 weeks we've been working on the coin (part time, unpaid, voluntarily, with tacotime having been on leave and dealing with personal matters) we've improved the hashing function used in Monero and in Bytecoin to 12x its original performance (our initial improvements doubled it, further improvements brought it up to ~12x performance). The Bytecoin devs have not merged this upstream, although it would be a trivial exercise for them to do so. This function speeds up mining, but far more importantly it speeds up verifying the blockchain. Try loading a blockchain from scratch in Monero and compare the speed to Bytecoin...it's not even slightly comparable. How Can Post Be Real If Our Eyes Aren't Real?